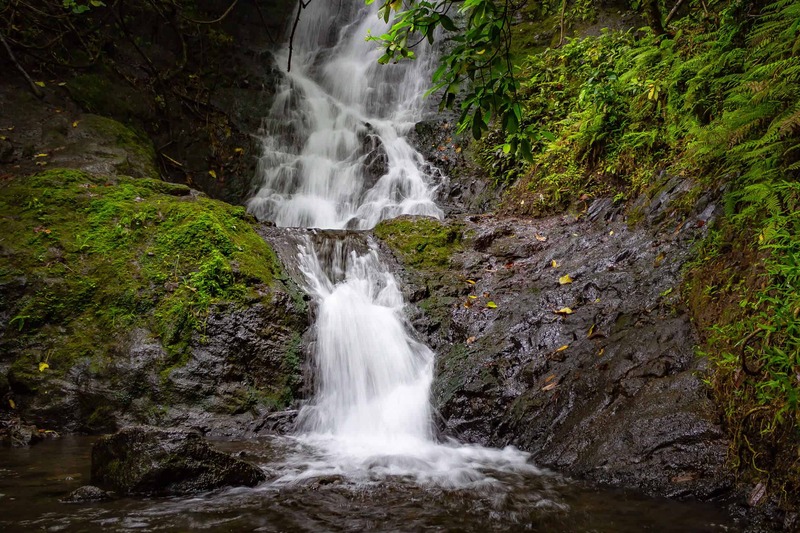 O’ahu is a waterfall lover’s paradise. There are so many wonderful hikes that lead to stunning waterfalls it can be difficult to choose which ones to see. If you want to visit a lesser known waterfall with an easy hike, consider hiking Likeke Falls Trail. I visited Oahu with my family in May 2018 to celebrate my sister graduating with her PhD from the University of Hawaii. My sister chose this hike because it was short, moderately easy, and less popular. Plus, it had a waterfall at the end! Continue reading to find out everything you need to know about hiking this trail! The trail starts behind the First Presbyterian Church’s parking lot located off of Kionale Road in Kaneohe. The church’s parking lot offers plenty of parking spaces, though you should park on the last row. Not only to be closer to the trail head, but to leave spaces for the church. Note – there is a turn on the right, off of Kionaole, towards the church. Veer right instead of following the road straight. As you start walking up the trail, you’ll know you’re at the right place when you see the large, graffiti-covered water tank. As you approach the tank, turn left and you’ll see the Likeke Falls Trail leading upwards. You’ll notice the trail is a red-colored, muddy path. It was lightly raining when I hiked this trail, but it rains a lot in this area so expect a muddy trail even if the sun is shining when you arrive. Also expect that red dirt to cover your shoes and get onto your clothing. As you may your way up the slop, you’ll be able to glimpse the Ko’olau Mountain range, the same mountains that can be seen from the Ho’omaluhia Botanical Garden. These mountains are the remnants of the Koolau (“windward”) Volcano (half a million years ago). Although the trail is well maintained, it is not free of obstacles. Roots are sprawled across the pathway, branches hang low like barricades, and slipper rocks are everywhere. Tread carefully and wear appropriate shoes. While watching your step, be sure to look around at the different plants, fruit, and wildlife. You’re most likely going to hear a symphony of bird songs on this hike. The Likeke Falls is one of the smaller waterfalls on Oahu. But it comes with a small pond for swimming. Its not very deep, making it more kid friendly than other waterfalls. If you’re careful, the two-tiered waterfall can be climbed easily for fun photos. I do not recommend jumping from this waterfall. There are some dry areas on either side of the falls to leave your shoes and bags so you can get in the water. Side note: the stream that flows from the falls crosses over the trail so your shoes will likely get wet before you reach the falls. Since the waterfall is small, it can get crowded very easily. There were four of us plus a family with four children when we reached the falls. It felt much busier than it really was, and I had to be very patient to take my photos. (I was also afraid small children were going to knock my camera into the water…). But, if you’re lucky enough to get there before any else does, you’ll feel like you’re in the middle of nowhere. It’s a wonder how it was discovered in the first place. This hike is very muddy! You’ll want to leave an extra pair of shoes in your car to change into, especially if you’re planning on going somewhere afterwards. I still have red dirt caked onto my boots. The trails on Oahu are surrounded by lush foliage and in areas that receive a lot of rain. That means mosquitoes! Did I mention the trail is muddy? You’ll definitely want a towel or wet wipes in your car for when you’re done hiking. You will somehow get mud on your legs and arms. Plus, you can then wipe off sweat and bug spray. Whether you’re using it to wipe off mud or to dry off with, having a towel in the car is a must. As I’ve said before, the trail is muddy and slippery. Wear shoes you don’t mind getting dirty and wet. You’ll also want some traction. River shoes are great because you won’t have to worry about taking your shoes off when you reach the falls. If you plan on swimming or wading through the falls, be sure to wear appropriate clothing. Even if you do not plan on getting in, there’s always a chance for rain! Although the trail is mostly tree-covered, if the sun is shining you’re at risk of getting a sunburn. The sun in Hawaii is no joke. If it isn’t sunny, like when we hiked this trail, you may get rained on. Wear a hat to keep the rain out of your face. Note: Be careful of Leptospirosis bacteria. If you plan on visiting any of the waterfalls in Hawaii, take precautions. Do not get in the water if you have a cut or abrasion. Its also advised not to put your head under water. Stay safe! To learn more, click here. Tip: On the way to the falls (or when you’re done hiking) stop at the popular Nu-uanu Pali Lookout! What is your favorite hike on O’ahu? Share in the comments! Have you hiked the Likeke Falls Trail? Share your experience!